A girl for all seasons: A little piece of Ga.
A little piece of Ga.
Barry was the first born grandchild. Because he couldn't pronounce "Grandad", our Dad became "Ga" and the name stuck. Ga's hobby was the restoration of old cars. He would spend a few weeks tinkering over his lastest purchase in the shed. Then he would forget about it for another few weeks, thus undoing all his hard work. Just before Dad died he was working on an Austin Vandan Plas. It then lay deteriorating in the shed for the next ten years. Barry moved to London and whenever he returned home, he would go out and tinker with the car, just like Ga did. Then this New Year Barry announced his engagement to Clare. Major excitement in the Lynam clan as it was to be the first family wedding in 8 years. Soon after, Barry arranged for the Austin to be shipped over to London. 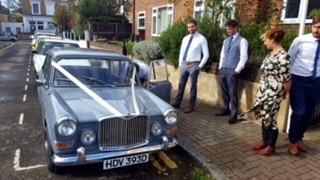 He obviously wasn't overwhelmed with wedding plans because he got the car to pass its NCT test. And the reason for all this work? 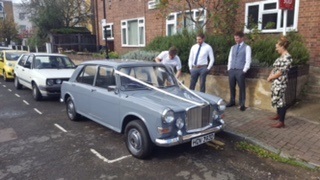 Barry wanted to use Ga's car for his wedding. All the Lynams descended on London for the nuptials. When we saw Ga's car driving around the corner we all welled up. Of course we felt sad because Ga couldn't be present. But the car meant that there was a little piece of him there with us and he would have been so chuffed to see his car actually motoring! Beautiful looking car, were the seats made of leather ?